CEVA has launched a lightweight, multi-purpose, processor IP core to streamline the design of cellular-enabled low data rate industrial and consumer loT devices. The latest core derived from the NEW CEVA-X architecture framework, the CEVA-X1 employs an extended Instruction Set Architecture (ISA) that, in addition to DSP processing, also allows it to efficiently handle CPU software workloads, such as protocol stack and system control. Comparing EEMBC CoreMark scores, a commonly used benchmark to measure the performance of CPU processing in embedded systems, the CEVA-X1 CoreMark/MHz score of 3.3 is on par with the most commonly used CPU for IoT stacks - the ARM Cortex-M4 - which achieves a CoreMark/MHz score of 3.4. This effectively eliminates the requirement for a separate CPU core in the system when using the CEVA-X1, providing significant cost, power consumption and ease-of-programming benefits of a single-core approach. Illustrating the use of the CEVA-X1 for low data rate, multi-purpose IoT devices, in a wearalone smartwatch use case, the complete Cat-NB1 modem including protocol stack and PHY running concurrently with GPS requires less than 150MHz, including ample headroom to handle additional functions such as sensor fusion. This exceptional performance is achieved using the CEVA-X1 together with optional dedicated Cat-NB1 instructions, optimized software libraries, protocol stacks and a peripherals subsystem which reduce the power consumption of the Cat-NB1 modem, excluding RF, by a further 30%. 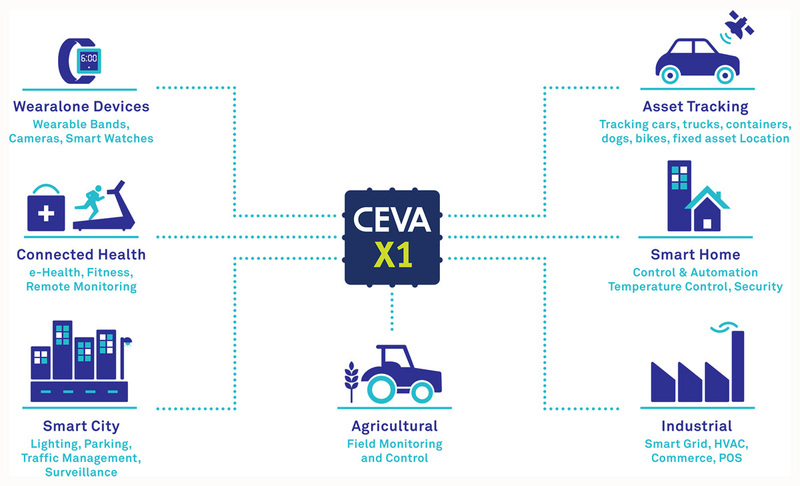 The CEVA-X1 IoT processor and the optional dedicated Cat-NB1 components are available for licensing now. For more information on the CEVA-X1, visit http://launch.ceva-dsp.com/CEVA-X1.